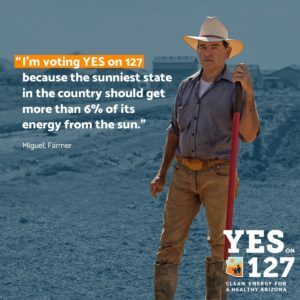 Voters in Arizona can confidently vote “yes” for Proposition 127, knowing that it will cut the use by state utilities of polluting fossil fuels like coal, oil and natural gas, and knowing that it will not cause an increase in electric rates. There has been persistent false propaganda against the measure, asserting that Prop. 127 will cause electric rates to go up from $200 to $1,000 per year or that it bankrupt public schools or that it would somehow hurt air quality. None of this is true. An example of these baseless arguments was the recent op-ed by Arizona Board of Regents member Karrin Taylor Robson who argued without evidence that Prop. 127 would costs schools millions. The article cited estimates by unnamed “public utilities.” If the article referred to a study from Arizona Public Service — the chief opponent of Prop. 127 — that study has been widely debunked. GCI’s analysis carefully reviewed two studies that used APS data — one from ASU’s Seidman Research Institute in March and more recently one from Arizona Residential Utility Consumer Office (RUCO). Both studies arrived at similar conclusions, with electric bills in today’s dollars going up by about $200 annually by 2030. By contrast, the analysis by the “yes” campaign for Prop. 127 suggests bills will go down by $30 in the same timeframe. “The general connection that can be made is that any impact on electricity rates, whether an increase or small decrease, will be modest compared to APS’ claim that they will go up at least $1,000 per year,” according to GCI Research Director, Dr. Dave Wells. The Arizona Corporation Commission already requires electric utilities to generate 15 percent of their energy from renewable sources by 2025. The initiative defines renewable energy as solar, wind, biomass, certain hydropower, geothermal, and landfill gas energies. Prop. 127 will increase the portion to be derived from renewable energy to 50% by 2030. Commissioner Andy Tobin already has a proposal to reach 80 percent clean energy by 2050. The beauty of solar, wind and hydropower is that once the infrastructure is built, the cost of the energy is zero. Coal, natural gas, and oil are dirty sources of energy. They produce the vast majority of global warming emissions and release toxic chemicals that pollute our air and water. 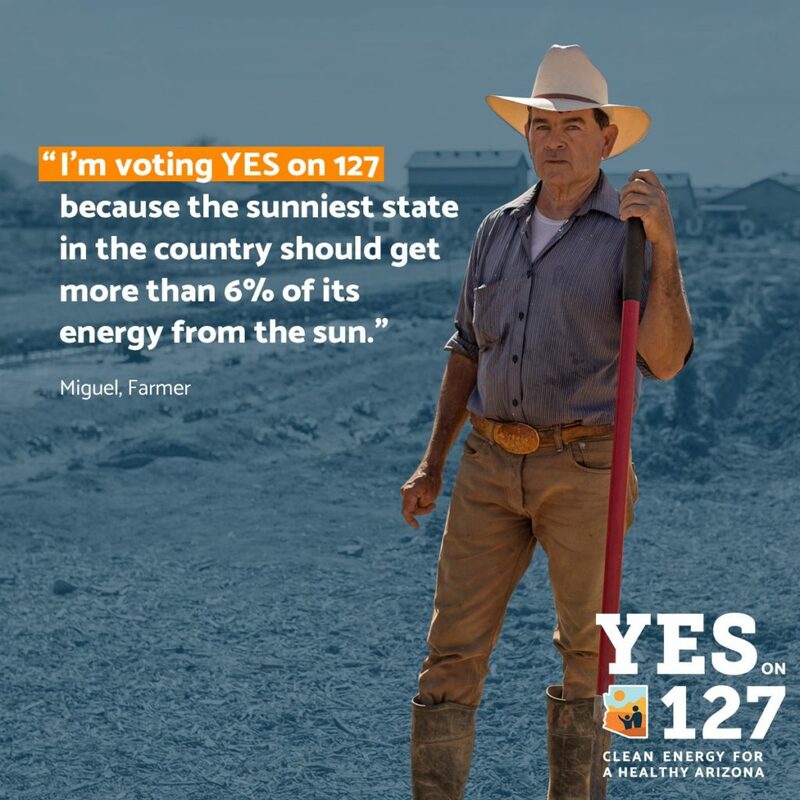 Arizonans can agree that its beneficial to cut back our reliance on fossil fuels. We all want clean water, clean air and a healthy environment. Prop. 127 will accomplish those goals, and voters who care about them will vote to approve Prop. 127. Are the tax breaks and subsidies you give to fossil fuel companies a “money grab”? Think, John, think before you post, we can all read what you say. And by “big business” I hope you understand that you are saying you support anti-competitive monopolies that gouge consumers and steal taxpayer money. You even gave away nearly a million dollars of taxpayer money to GEO because you wanted them to have free money without actually doing anything to earn it. Think, please, you represent this beautiful state, and you look foolish every time you post here. The same “big business” that offshores American jobs and hires undocumented immigrants to pick crops/butcher meat/clean their offices? The same “big business” that took Bush’s bailout money and then paid themselves bonuses? The same “big business” that took the Rand Paul/Trump tax cuts and promised everyone a $4,000.00 a year raise, then did stock buybacks instead to make themselves richer? All while raising the deficit to record amounts and blasting the debt through the roof? I just really want to understand what “big business” mean when you say it, because I work in the private sector, something you have never done, and “big business” is not a friend of the American worker or the America taxpayer. See John, you made a critical mistake, you said “big” business instead of “business”. You are saying you support the big multi-nationals that are stealing America’s wealth while offshoring jobs and laying off thousands all while the economy is booming. Think, John, think before you click Post Comment.